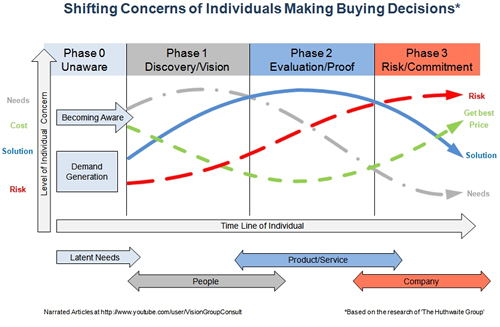 The buy-sell cycle is aligned with how individuals make buying decisions, the customers buying process - Part 2. With a solid list of customer messages crafted to allow the customer to visualize usage and begin building a common language, (part 1), we are ready for the next step. Lining up sales methods with the shifting concerns of how individuals make buying decisions. Whether the B2B customer is making the buying decision with 1 person or a Buying Committee, we are selling to individuals with individual business needs. Many sales people have been trained it is not about "What you sell", it is about "How you sell". The next leg of the journey. It is not about "How you sell", it is about "How your customers buy". Tip 1: Begin with one of the largest studies done on buyers. Xerox researched 35,000 buyers and how they made buying decisions. The following diagram is based on the results. The research was done by the Huthwaite Group, which leads to the creation of SPIN. SPIN is a sales method which works best with products where the business usage is easily understood by the person buying the product. The prospect does not require assistance discovering business needs, creating a solution based on value and evaluating alternatives. If you are selling products or services where the business usage and value is not readily understood by prospects. It is important to be able to assist them with their shifting concerns as they are making a buying decision. During the buy-sell cycle, it is not about "IT". It is about what buyers can achieve with "IT". Tip 2: As an individual moves from unaware, (latent needs), to discovery, (active needs), the focus in a B2B setting is on the person helping them, (see the bottom of the diagram above). 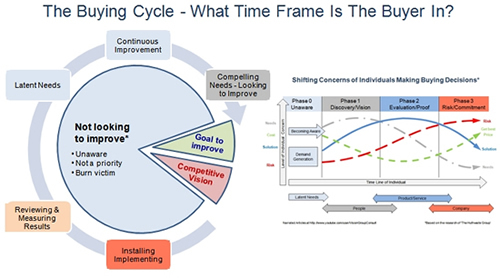 During the discover phase, needs are the primary concern in the beginning, being replaced by a Vision of a Solution towards the end of this phase. It is during discovery individuals are most interested in discussing their needs and solutions based on value. Thinking about this from an internal view, is your sales team prepared to have business conversations around needs and potential solutions based on the titles of the individuals they are calling on today. Or are they prepared to make product and service pitches and presentations? Listen to the narrated article for a full explanation of the above diagram on the shifting concerns of how individuals make buying decisions. Tip 3: In many cases, there will be more than 1 person who reviews needs, evaluates, decides and purchases a new product or service. If there is more than 1 person, we need to understand each person has their own shifting concerns. Said another way, each individual has their own personal buying cycle with 3 primary phases. Knowing this we can have various members of a buying committee in different phases during a buy sell cycle. 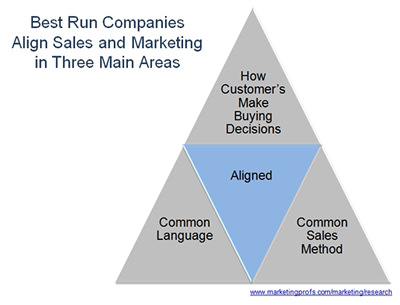 We need to have sales stages and steps which help align the buying committee members. As a buying facilitator, (not a sales person), part of the job is to help buying committees line up their concerns and get on the same page at the same time. Another way to think of this is each person has their own personal clock in regards to where they are in the buy-sell cycle. Tip 4: As the Vision of a Solution becomes the primary concern, the individual is moving from discovery into the evaluation and proof phase. If you sell a product or service which is not readily understood by prospects on how the usage will help improve their businesses, why would we presume they know how to effectively evaluate alternatives? The sales stages and steps need to help the buying committee evaluate if it makes sense to make a buying decision. The role of a sales person as a buying facilitator is to help buyers prepare a buying evaluation plan. Tip 5: Part of proof in the prospects mind, (phase 2), is whether a transition from today's way of doing business to tomorrow's new way is possible for the company. The same comments ring true for transition as they do for evaluating. This means the sales stages and steps need to help the buying committee develop a transition plan for the potential new solution being considered. Tip 6: During the commitment phase, (phase 3), individuals move into risk as the buying decision and a transition to potentially change the business moves closer. It is important to prepare and train the sales team to help prospects with the feeling of risk and focusing on a win-win. This includes how we negotiate at the end of the buy-sell cycle. If we are not prepared for a win-win negotiation, it will come down to price. Unfortunately nobody really wins when price is the only thing on the table. We need to arm our sales people with pre approved negotiating tactics and use what we call a get-give approach. The main point is to go in prepared, don't let the sales team "wing" negotiating. Here is an article on win-win negotiating. Details of handling risk are covered towards the end of the narrated article, shifting concerns of how individuals make buying decisions. 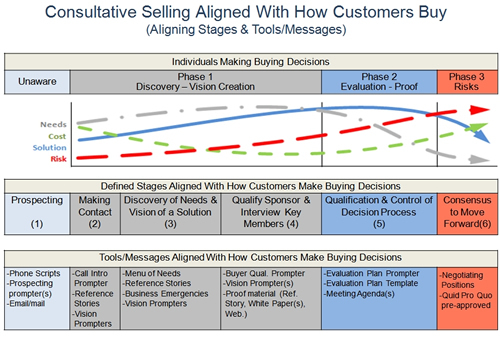 At this point we have research based buying phases lined up with consultative sales stages. In part 1 we crafted customer focused messages which help individuals, by their respective title, understand how to consider using the product or service to help improve their business and satisfy their needs. In part 3 we cover the final leg of our 3 legged stool on how to align sales and marketing, a common sales method.